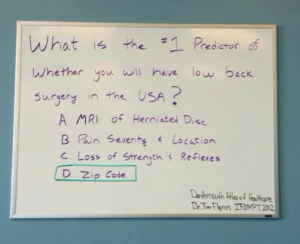 WHAT’S THE #1 PREDICTOR OF GETTING SURGERY FOR BACK PAIN? ATTENTION: Circus artists with back pain! Here’s a REALLY interesting (and SCARY) statistic on the NUMBER ONE PREDICTOR of if your have surgery for low back pain…. Yep. The number one predictor is HOW MANY SURGEONS ARE IN YOUR ZIP CODE!! Surgeons like to do surgery. What’s the second predictor? Whether or not you get an MRI. Here’s why: When you have back pain, you go to the doctor. Maybe urgent care, maybe your primary care physician, maybe the ER. That doctor does one of several things: refers you to a physio, gives you drugs, or refers you to an orthopedic surgeon. If you end up at an orthopedic surgeon’s office, they will do an exam and either 1) send you to a physio, or 2) order an MRI. Here’s where issues arise. MRI findings are NOT always correlated to pain and dysfunction in the lumbar spine!! What does this mean? This means that disc degeneration or disc bulging is a normal part of the aging process. Take a look at this chart. This study examined MRI’s on over 3,000 people WITHOUT BACK PAIN. 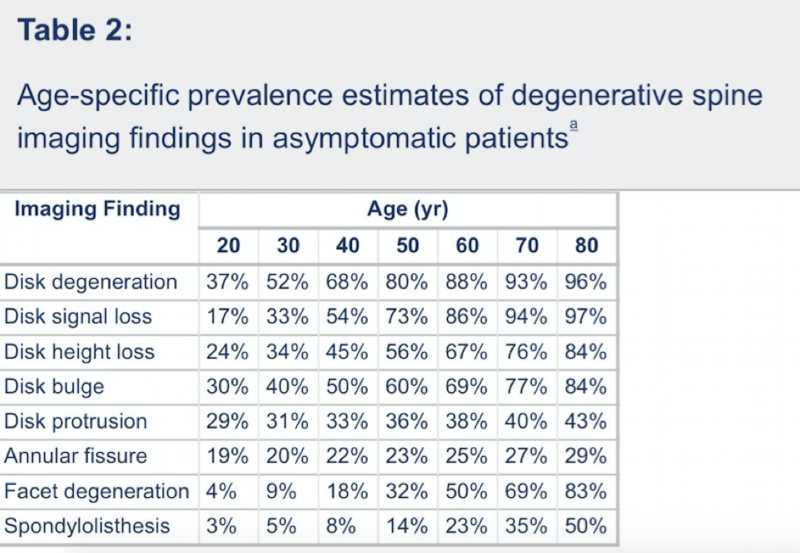 You can see that over one third of people over age 20 showed findings of disc degeneration, and 30% had a disc bulge.Here’s where the problem is: if you have back pain and end up with an MRI, your surgeon MIGHT say something like “you have a disc bulge. Surgery will fix this! Let’s do surgery.” This makes sense, right? Plus, there’s something very comforting when, as an athlete in significant pain, someone offers a seemingly logical solution. But what if the pain ISN’T coming from that disc? Then, you just went through a LOT of expensive imaging, had an invasive and risky procedure done, and it didn’t even fix the problem. To avoid this scenario (and potentially save A LOT of money), go see a PT. They might be able to offer a different perspective, and just might get you back on your apparatus quicker, more efficiently, and with more cash in your pocket. 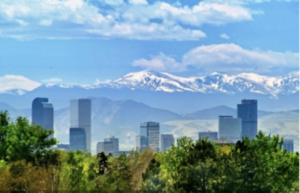 Fun fact: The zip code with the highest incidence of surgery for low back pain is in Denver, Colorado!